I first published this on 06/21/2007 but it still seems as relevant now as it was back then. 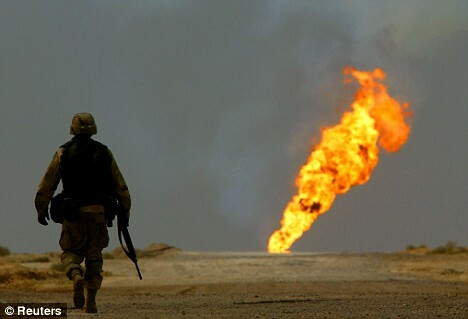 Critics of the War in Iraq have argued that the invasion was always more about oil than any of the purported reasons like weapons of mass destruction or atrocities that the neo-cons bandied around. This claim, by the way, is not as far-fetched as you would think. The Iraqi government approved a new hydrocarbon law on the 26th of February which is currently being mulled over by the Iraqi parliament. If approved, this legislation will hand over Iraq’s entire oil wealth to Western oil companies on a silver platter. For example, the law allows western companies to operate underProfit-Sharing Agreements or PSAs . Under this arrangement, Iraqi provinces will share the profits only after the oil companies have taken their cut. No other major Middle Eastern oil producer has allowed anyPSAs on its territory. In fact, PSAs are used only in 12% of the world’s oil reserves, some of them signed in times of political upheaval as in Russia. The new law also freezes thePSAs for a period of 30 years. What this means is that any future Iraqi attempts to renegotiate the contract before the 30 years are up will be arbitrated internationally. We all know what that means. The law also permits the oil companies to take their profits out of the country without paying any taxes. While the costs of developing the oil fields are being recovered, companies will be able to recoup 60 to 70% of revenue as against the more usual 40% elsewhere. Also, after the costs have been recouped, the law allows oil companies to keep 20% of revenue – 10% more than is normal. Supporters of the law argue that being so generous with the oil companies is a necessary evil because those companies need to be persuaded to set up shop in a volatile and insecure country. They also assert that the investment will jumpstart the faltering Iraqi economy and seed a robust private sector. However, this claim sounds hard to believe when you factor in the enormous oil wealth that Iraq is sitting on. Iraq has 115 billion barrels of the world’s known oil reserves. This amounts to 10% of the world total — the second largest conventional oil reserves of any country; and most of it is poorly developed — only 24 out of 71 discovered oil fields have been developed. With Saudi oil production projected to decline in the near future, Iraq is set to become a major player in the oil-producing world.